Born: Sybil Veronica Connolly in Swansea, Ireland, 21 January 1921. Education: Sisters of Mercy Convent. Career: Apprentice dress designer, Bradley's, London, 1938-40; apprentice to Jack Clarke at Richard Alan, 1940-43; director, Richard Alan, 1943-57; Designer, Sybil Connolly, Inc., 1957-98; consultant and designer for Tiffany's, New York, 1984-98; author and editor, 1986-98. Awards: Britain's Woman of the Year, 1958. Died: 6 May 1998, in Dublin, Ireland. Editor, In An Irish Garden with Helen Dillon, New York, 1986. Editor, In An Irish House, New York, 1988. Irish Hands: The Tradition of Beautiful Crafts, New York, 1994. 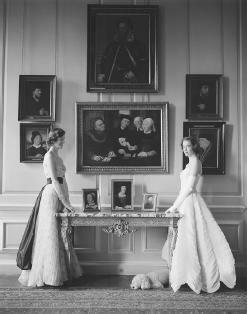 Lady Melissa and Lady Caroline Wyndham-Quinn modeling Sybil Connolly-designed evening gowns, 1954. Stegemeyer, Anne, Who's Who in Fashion, Second Edition, New York, 1980. ——, Who's Who in Fashion, Third Edition, New York, 1996. Brenner, Douglas, "Eire Apparent," in House & Garden, September 1989. Collins, Amy Fine, "Tribute to the Fashion Style of Jacqueline Kennedy Onassis," in Harper's Bazaar, 1 August 1994. Greiner, Virginia, "Improving Old Skills and Finding New Ones," in the Washington Times, 19 March 1995. Bryant, Kathy, "A Pattern of Success," in the Los Angeles Times, 15 June 1996. "Sybil Connolly," in the Daily Telegraph, 9 May 1998. "Sybil Connolly," in the Economist, 16 May 1998. Smith, Liz, "Bring Back Madeline," in Newsday, 19 May 1998. "Obituary: Sybil Connolly," in the Independent, 26 May 1998. There comes a moment in everyone's life as a designer when you have to decide whether you want to create the beautiful or the merely fashionable. Sadly, there can be a conflict between the two. In the course of her career, Sybil Connolly gave Irish fashion a name and designed gowns for American lights such as Merle Oberon, Elizabeth Taylor, Fred Astaire, and Jacqueline Kennedy while she was First Lady, as well as for many of Britain's peers. Connolly began her fashion apprenticeship while in her teens, going to work for a London dressmaker to study dress design. Her most notable experience during her two-year tenure there was holding pins for Queen Mary's fittings at Buckingham Palace and noting the immense care being taken to design dresses that softened and complemented the dowager Queen's advanced age. Her apprenticeship at Bradley's was cut short by the outbreak of war, and she returned to Ireland. In 1940, she continued her apprenticeship at Richard Alan, which was at the time Dublin's premiere fashion house. At the age of 22, Connolly became director at Richard Alan and proceeded to build the store's couture department. In 1950 she designed a small collection that sold quite well, and her career as a designer began. One of Connolly's early patrons was Lady Dunsany, and her first major show took place at Dunsany Castle in 1953. There, her designs came to the notice of members of the American fashion press, and the same year she took a collection to the United States. Her singular designs and handsome Irish fabrics were well received. Over the next few years, she was profiled in Time magazine, and her designs appeared in Vogue and Harper's Bazaar and on the cover of Life. She left Richard Alan and set up Sybil Connolly, Inc. in 1957 at her Merrion Square house in Dublin, and her clothes were soon carried at specialty boutiques across the United States. Connolly's design philosophy was in keeping with that of Hubert de Givenchy, whose work was a source of inspiration for her. Elegance without sacrificing comfort, the finest craftsmanship, and attention to detail were the hallmarks of her work. She felt that a dress should show a woman's curves, saying, "I must see movement in a dress. A woman's body is inside. It breathes. It moves." Her other major sources of inspiration were nature and the traditional fabrics and everyday clothing of the Irish. Working in Donegal tweeds, Eliot's poplin, Carrickmacross lace, bainin (a thin, handwoven wool) and Irish linen, she created collections based on the simple slim lines of riding habits, and utilized the hooded cloaks, scarlet flannel petticoats, crocheted blouses, and black Connemars shawls of Irish traditional dress. She also designed evening dresses with ruffled tops, a coming-out gown made entirely of men's linen handkerchiefs, and handkerchief linen nightgowns embroidered with flowers and hand-sewn with tiny tucks, which were a favorite of Jacqueline Kennedy's. Throughout her career, Connolly sought out and utilized the traditional crafts and artistry of her native land: Donegal embroidery, handwoven lace, and iridescent Donegal tweeds. She commissioned the nuns of Clones Convent to make lace for her and found inspiration in the simple lines of a Carmelite nun's habit. Connolly brought echoes of Irish daily life into vogue among the best dressed of the rich and famous. Indeed, Connolly was herself often included on American best-dressed lists. The invention of a unique linen fabric is considered one of Connolly's greatest achievements. Using nine yards of handkerchief linen backed by taffeta to make one yard of hand-pleated dress material, she created an uncreasable, uncrushable linen, which she then custom-dyed in rich colors and fitted into lovely ball gowns. The gowns were so resistant to the ravishments of time that they were an investment lasting generations, handed down from mother to daughter to granddaughter. Jacqueline Kennedy wore a skirt of Connolly's pleated linen when she was painted by Aaron Shickler for a portrait that hangs in the White House. Throughout the 1950s and early 1960s, Connolly enjoyed popularity on both sides of the Atlantic. In the 1970s she continued to bring small collections to New York. She would show them at the Fifth Avenue apartment of a friend, gather orders for custom designs, and take them back to be made up in her Dublin workshops. But the trends of fashion in those years were not to her taste, and she had no interest in following them. She was known to comment that she couldn't understand why the young people of the time were so set on making themselves look "awful." The skirts were too short, the lines were not right, and trousers were "only for riding." Like her great inspiration Givenchy, Connolly's sense of style found expression in a full range of mediums beyond couture. She was a designer of lifestyle, not just clothing. She wrote books on garden design and interior decor—specifically Irish gardens and Irish homes— and restored a 1789 cottage in Cahair, County Tipperary. Connolly also designed crystal, china, and pottery for Tiffany & Company (New York), as well as wall coverings, clocks, and fabrics.